Traditionally, the roles of Christian ministry have been thought of as priest, pastor, and prophet. Donald E. Messer adds five contemporary images: Wounded Healer, Servant Leader, Political Mystic, Practical Theologian, and Enslaved Liberator. By combining these new images with the more traditional roles, readers will develop their own personal vision of Christian ministry. 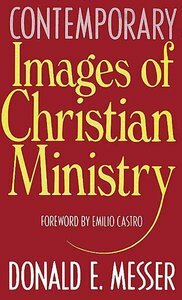 About "Contemporary Images of Christian Ministry"
Donald E. Messer is an educator, author, practical theologian, civil rights activist, and United Methodist clergyman recognized worldwide for his humanitarian service combating world hunger and HIV/AIDS. He is the author of 15 books, including Breaking the Conspiracy of Silence: Christian Churches and the Global AIDS Crisis and Ending Hunger Now (coauthored with Senators George McGovern and Bob Dole).